Wedding/Party Info - Brass and Co. Thank you for considering Brass & Co. for your event entertainment. As a professional dance band, we can fulfil all of your musical needs. Please continue reading for information about our wedding band service, or, click here for information about booking Brass & Co. for a corporate event or party. 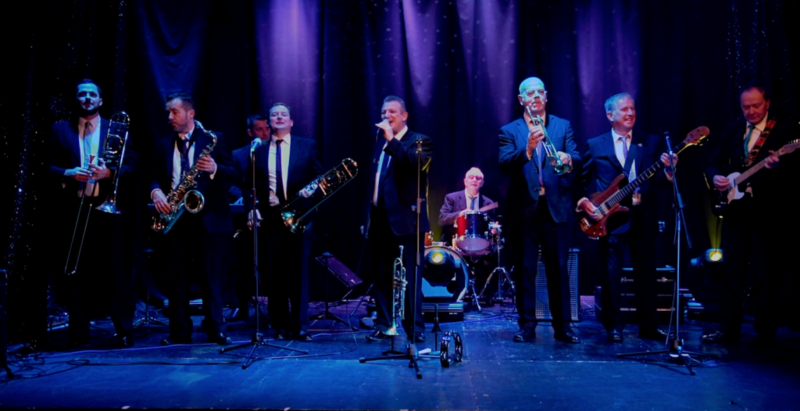 Brass & Co. cater for people who are serious about their event band, those who want to create an atmosphere above and beyond run-of-the-mill wedding bands! We don’t use backing tracks – just real live music, played by some of the best musicians in the country. In fact most of us play several instruments, giving the band a huge amount of flexibility and programme variety. 5 members of the band are experienced singers and we match each voice to the style of each song we perform – whether it’s Frank Sinatra or Bruno Mars! You guys were absolute and true stars… we can’t thank you enough for adding so so much to our day! We are constantly updating our material. Some of the newer material includes Justin Timberlake, House of Pain, Pharell Williams, Bruno Mars, etc. 80s & 90s music is well represented of course but we can go right back, swinging into the big band era through to Motown and disco classics. 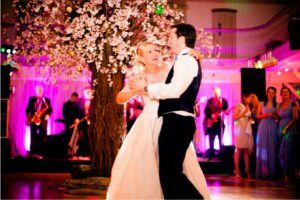 We have carefully arranged classical Strauss waltzes or quicksteps and jives if that’s what the crowd wants… its all about having fun and keeping the dance-floor full! The choice is yours! What You Get with Brass & Co.
Professional consultation throughout the booking process with our friendly manager Tony who will discuss your musical tastes. Specially arranged first dance(s) – it’s our pleasure to learn your special song(s). A timely ‘check-in’ to make contact in advance of the big day. A full energetic and enthusiastic performance. Professional PA and sound equipment. Professional lighting on your stage area and dance floor to transform your venue and set the party atmosphere. Digital music played during service of late-night food (if required). (*may incur a supplementary cost, please ask on inquiry). Our band has an exciting line-up of vocalists, keyboards, guitar, bass, drums and a full brass section, featuring trumpet, trombone and alto/tenor saxophone. Several band members play more than one instrument so Irish whistle, keytar, flugelhorn, mandolin, clarinet, additional guitars and auxiliary percussion are frequently incorporated also depending on the style of the song we are performing. Our 5 vocalists enable us to cover all styles of music. Our hot brass and driving rhythm sections promise to keep your guests on their feet all night long, from the first dance to the last encore. They will find our energy and enthusiasm contagious! Brass & Co has developed a very special live sound which has made it one of the most highly sought-after and respected bands for many of Ireland’s most prestigious functions and events. For more information feel free to contact us.